Entrepreneurship: Kevin of Site Help Center offers tips on Writing a Business Plan. Environment: Vihar Sheth presents the only environment related article in this carnival in Acting A Fool. Entrepreneurship: Angela Randall of AngelaRandall.com presents Wake Up To The Small Business Bank Account Trap (And How You Can Avoid It). Entrepreneurship: Christopher Brunner at The Small Business Buzz sent in 3 posts: Mompreneurs, Becoming a Government Contractor and How to Setup a Family Business. Finance: Free Money Finance has 301 Saving Money Posts - Hundreds of Ideas on How to Save Money. Internet: Julia Dorofeeva from Online Dating Blog asks and answers What makes women sign up for Adult Dating Sites? Entrepreneurship: Travis Farnes of Self Improvement with Travis Farnes presents Life as an entrepreneur: Living through the hard times. This was one of my favorite posts. Management: Tony Clark of Success from the Nest says to Stop Asking How… Click to find out why. Management: Surfer Sam and Friends presents My job is all funny business. Great Job Jokes at Surfer Sam. It starts with the 10 best things to say if you're caught sleeping at your desk. Management: David Maister at Passion, People and Principles asks us if Are We ON The Same Side? Finance: Bryan C. Fleming shows How to Set up Your Automatic Savings Account. Finance: Trust Matters presents A Little More Outrage, Please! saying, "The options backdating scandal is fundamentally about integrity and honesty, not about the dollar amount scammed. For a national magazine’s senior editor to headline his comment as “Backdating: a Little Less than Meets the Eye” is to miss the point and—as evidenced by his responses—to influence others to miss the point as well." Marketing: Kevin Hillstrom at The MineThatData Blog presents Mergers and Acquisitions stating that "The sale of Eddie Bauer continues a trend of consolidation in the specialty apparel retail industry." Marketing & Internet: Jim Cronin at The Real Estate Tomato wants to know Who Are You Blogging For? Another favorite article. Finance: Joshua Dorkin at Real Estate Investing For Real presents Real Estate Partnership Questions. Economics: Trent presents Oil Revisited at Stock Market Beat. Personal Development: According to Johan Safsten, Secrets will be found out with time! Finance: David B. presents Top 3 Easiest Ways to Make Money posted at How Do People Get Rich?. Entrepreneurship: Jack Yoest shows The Best Company Structure in Four Easy Steps at Reasoned Audacity. Entrepreneurship: Harrison offers 5 reasons why online business is so attractive at Journey To Financial Freedom. Management: Sanjay Kumar explains How to adopt new technology in existing businesses posted at SimplifyThis. Great insight here. That concludes this edition. 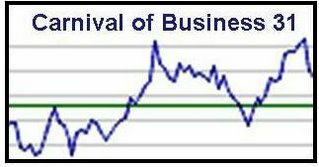 Submit your blog article to the next edition of the Carnival of Business using the carnival submission form. Past posts and future hosts can be found on the blog carnival index page.